In March 2009 a new “Elephant & Castle Regeneration Charter for Community Inclusion and a Better Quality of Life for All” was launched by local people and businesses. 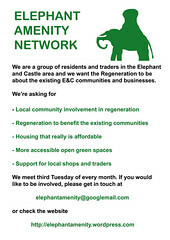 We, the communities and traders of the Elephant and Castle, are being excluded from the multi-billion-pound regeneration being led by Southwark Council. The redevelopment of the core area is subject to a private deal with Lend Lease, who are drawing up the masterplan for the area. No information on the masterplan and none of its details has been given to us since the Development Framework of 2004. Meanwhile, the council is building “Early Housing” developments on our much needed open space, green space & play areas, as well as removing our local amenity shops, garages, residents’ parking spaces and other community facilities and substantially reducing levels of daylight for many residents. Three quarters of the homes in these new developments will not be for the Heygate Tenants, despite this being an explicit rationale for their inclusion in the Southwark Plan, but for private sale. We believe that the regeneration process must be fair, just, and socially inclusive, and must provide for affordable housing and a better quality of life for all current and future residents of the area. Our specific requests are set out under three principles below. The developers and the Council to hold a public meeting to explain the masterplan, its benefits and how they will involve the local population in future steps in this process. To commit to keeping all open space as fully public access at all times – no “semi private space” and no restrictions on access to the general public through gating. 75% of all Early Housing sites should be social rented by unit, with the remainder intermediate, as based on the original tender. There must be no evictions or forced removals from the Heygate estate or elsewhere. Tenants should be allowed to move directly to the Early Housing sites or given enough time to find accommodation acceptable to them through Homesearch.